Invention of right here, right now... Arrrgh, is the moment passed, missed or caught? Very special next appointment with Original Motion, third encounter still as a trio. 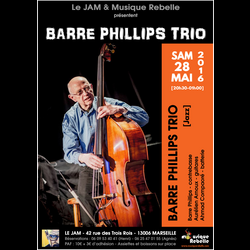 An exceptional event with one of the musicians who fly the flag, the shortest way, one of these explorers of the "right here, right now" concept, a reference in improvised music: bassist Barre Phillips. Doors open at 19:30. Food & and drinks available on the premises.